Thai Massage is a series of stretches combined with pressure points to stretch the muscles and create more energy flow or “Prana” in the body. “Prana” or energy comes from two sources; one directly from the cosmic ether while the other is derived indirectly from food and oxygen. Both are concentrated in the center of the brain and flow into the entire body through six subtle centers in the spine (Chakras) These centers in the brain and spine send energy through the nerves to all the vital, sensory and motor parts of the body. The thai massage practitioners ultimate goal is to enhance and increase the life force energy in the recipient. The ancient teachers believe that the simplest way to send “Prana” is to connect yourself with this cosmic source and imagine that energy is flowing through your hands to the recipient. While applying pressure on the pressure points, it also helpful to visualize the area you’re working on is being healed. Massage effects the life force by opening up the channels and helping to stimulate it to move freely. The “Sen Sib” or energy pathways, that when blocked, may cause illness and imbalance. While using either thumbs, fingers, palms, elbows, knees our feet, the massage practitioner presses on the pressure points along the body to stimulate healing and free the blockages. These pressure points are directly on the muscles and bones and inside the muscles where there are blood vessels, lymph nodes and nerve fibers. Therefore, each time the tissues are pressed and released, it is the same as tensing and relaxing all of those cells to increase the life force within them. During tensing, the cells are charged with oxygen and energized. When the pressure is released, the relaxation occurs which brings rest to the cells resulting in vitality and rejuvenation. Life force energy or “Prana” is the link between the body and mind. Thai massage recharges and heals the body by stimulating the life force within and opening up the energy channels to enable energy to flow freely. 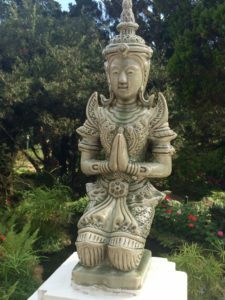 When the practitioner performs thai massage correctly, the intangible outcomes may be feeling peaceful, more energetic, happier, a feeling of balance and good health, and relaxed and refreshed.